This month the Mommy's Mani Monday group hits our three-year anniversary. To celebrate, we paired off and recreated other MMM members' first ever manis for the group. 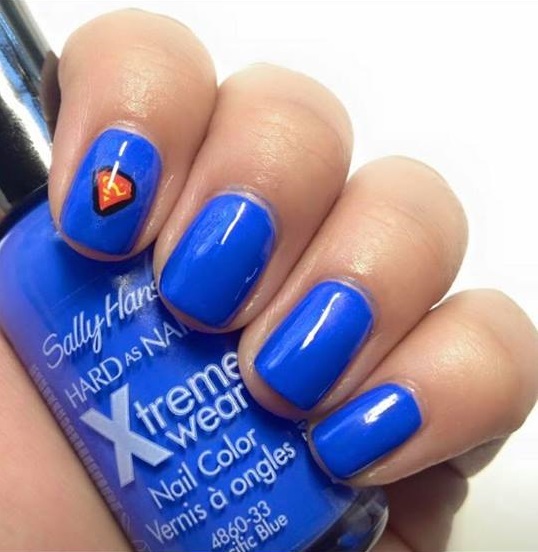 I got to redo Jazmin's first mani, a Superman design. For my version, I moved the logo to my middle nail and did multiples instead of one. I started with a base of Nails Inc. Baker Street and used acrylic paint for everything else. Below is Jazmin's original design. Don't forget to stop by the #mommysmanimonday tag on Instagram to see everyone's recreations too!